A memoir of a life lived in pursuit of equality and social justice. Steinem’s core message is one of a shared human experience, and a hope that one day we can be reunited in equality. One of her most powerful calls to action is that “Our current plight is not made inevitable by human nature”, at once building up the confidence of those who believe something better is possible and also eliminating the shadow of faux-inevitability that division along gendered lines cast across society. 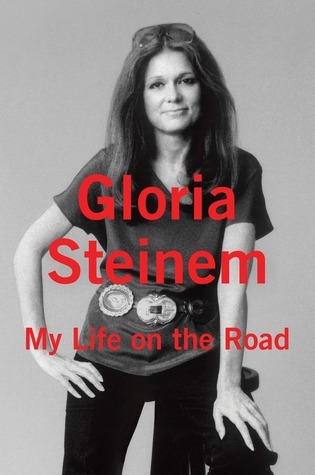 Steinem’s life has been spent on the road, from her childhood travelling across America to her adult life as a journalist and feminist campaigner. The book is very loosely grouped by theme rather than chronology, covering topics such as family, heritage and identity, politics, and taxis. The style is conversational and some sections are simply a series of related anecdotes on a theme with a paragraph each. Of these the section about air hostesses was the most surprising, as it wasn’t a topic I had thought much about but certainly is a key example of discrimination and sexualisation that is particularly visible to those who travel frequently. Steinem observes in a related section that “A pedestal is as much a prison as any small space” which I thought was a perfect example of why women being chosen over men for a particular job or task is not ‘positive discrimination’ it’s a situation where everyone loses. My favourite section of the book described many of the fascinating and insightful conversations Steinem has had over the years while travelling in taxis. The anecdotes were funny and touching. My main criticism of this book is a matter of editorial choice, rather than a criticism of the narrative of Steinem’s life. The book feels very US-centric, despite much of her time ‘on the road’ being spent overseas. The introduction addresses readers directly as though they must be in the US (or at least from there), and there is a long section about political campaigning in US presidential elections. The introduction bothers me because it would have been so simple to edit to be more inclusive, and it shows how narrow the intended audience was. The presidential campaign section bothers me because it didn’t include a broader exploration of how inequality is linked to power across every platform of life, and how the politics of gender and race play out across political lines. Something to that end would have been very interesting and contain lessons for others around the world. Instead we get a name-by-name recap of the last 30+ years of elections with personal anecdotes about meeting each of the candidates. There is some superficial commentary on the role of the media, but not to the extent that I expected – especially given Steinem was a journalist and magazine founder for much of her career. Despite the occasionally gloomy subject matter, and the frustrating continuation of so many forms of inequality, Steinem’s book is a hopeful one. She says that “Altogether I’ve seen enough change to have faith that more will come” and in that I believe her. It wasn’t a perfect book but I am so glad that I read it, and it will form a springboard to explore lots of other literature. This book is suitable for ages 16 and up based on some of the themes, but probably more easily enjoyed by a slightly older audience.